Secondary school, Year of Graduation -1982. 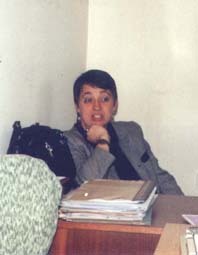 1988 - 1995 Assistant Professor of Ecology and Conservation of Nature, Department of Ecology, Biological Faculty, University of Plovdiv. 1995 - Senior Assistant Professor of Ecology and Conservation of Nature, Department of Ecology, Biological Faculty, University of Plovdiv. 1998 � Ph.D of Ecology and Conservation of Nature, Department of Ecology, Biological Faculty, University of Plovdiv. 2005 - 2013 - Associate Professor of Ecology and Conservation of Nature, Department of Ecology, Biological Faculty, University of Plovdiv. 2013 - present day - Professor of Ecology and Conservation of Nature, Department of Ecology, Biological Faculty, University of Plovdiv. 2009 - present day - Associate Editor of "Advances in Environmental Sciences - International Journal of the Bioflux Society"
Batchvarov, G., I. Veltcheva, 1995. Etude du contenu de plomb /Pb/, zinc /Zn/, cadmium /Cd/ dans Leuciscus cephalus L. /Pisces, Famille Cyprinidae/ du bassin de la riviere Arda /Bulgarie du Sud/. - Travaux Scientifiques d'Universite de Plovdiv, Biologie, Animalia, 31(6): 71-75. Veltcheva, I., 1997. Research on the content of cadmium /Cd/ in diferent organs of perch /Perca fluviatilis L./ /Pisces, Percidae/ from the artificial laces "Kardjali" and "Studen kladenetz" on river Arda. - Acta Zoologica Bulgarica, 50(2/3): 43-48. Velcheva, I., K. Sapundjieva, P. Kostadinova, 2001. Ecomoitoring Study of the Condition of Soil Cenoses from Heavy Metals Contaminated Grounds. - Bulgarian Journal of Agricultural Science, 7: 319 - 324. Veltcheva, I., P. Kostadinova, V. Popov, 2001. The Heavy Metals Impact on Soil Mesobiota. - Journal of Environmental Protection and Ecology, 2(3): 637 - 641. Velcheva, I., V. Noncheva, 2001. Forecasting the Zinc /Zn / Content in the Muscles of the Freshwater Fish. - Acta Zoologica Bulgarica, 52(2): 91-96. Velcheva, I., K. Kouzmova, P. Kostаdinova, 2002. A study of biodiversity in an agricultural region adjacent to the protected Chinar dere site. - Journal of Environmental Protection and Ecology, 3(3): 673-677. Kouzmova, K., P.Kostadinova., I. Velcheva, 2002. Ecological monitoring of mezobiontic fauna in areas of intensitive and biological farming. - Journal of Environmental Protection and Ecology, 3(3): 656-660. Ivanova, E., T. Staikova, I. Velcheva, 2002. Mutagenic effect of waters, polluted with heavy metals and cyanides, on a Pisum sativum plant in vivo. - Journal of Balkan Ecology, 5(3): 307-310. Velcheva, I., E. Ivanova, 2002. Heavy metals and isoenzimes specificity in organs of fresh water fish. - Journal of Balkan Ecology, 5(3): 311- 318. Velcheva, I., E. Ivanova, 2002. Superoxidedismutases in fish organs from fresh water basins polluted with heavy metals. - Journal of Balkan Ecology, 5(4): 436-442. Ivanova, E.N., I.G. Velcheva, T.A. Stajkova, P G. Kostadinova, 2002. Somatostatic effect of heavy metals and cyanide contaminated waters on a Pisum sativum L. plant system in vivo. - Journal of Balkan Ecology, 5(4): 443-446. Velcheva, I., 2002. Content and transfer of Cadmium (Cd) in the ofganisms of fresh water fish. - Acta Zoologica Bulgarica, 54(3):109-114. Velcheva, I.G., 2001. Contents and transfer of copper in freshwater fish. - BIOS, Scientific Annals of School of Biology of Aristotle University of Tessaloniki (Macedonia, Greece), 6: 49-60. Velcheva, I., V. Noncheva, 2005. Regression Models Describing Zinc (Zn) Accumulation in the Fishbone of Freshwater Fish. - Acta Zoologica Bulgarica, 57(2): 237-244. Mollov I., D. Georgiev, B. Todorova, S. Stoycheva, I. Velcheva, B. Nikolov. 2009. A Review of the Influence of the Urbanization on the Vertebrate Fauna of the City of Plovdiv. - Biotechnology & Biotechnological Equipment, 23(2 Special Edition): 242-245 [Full text - PDF] . Velcheva I.G., B.N. Nikolov. 2009. A Study on the Processes of Distribution, Accumulation and Transfer of Copper (Cu) in the Organisms of Fishes. - Ecologia Balkanica, 1: 15-20 (In Bulgarian, English Summary) [Full text - PDF] . Velcheva I.G., A.D. Arnaudov, E.S. Georgieva. 2010. Influence of Zinc on Gill Morphology of Gibelio Carp (Carassius gibelio). - Ecologia Balkanica, 2: 19-23 [Full text - PDF] . Mollov I., I. Velcheva. 2010. Spatial distribution and retrospective analysis of the herpetofauna in the city of Plovdiv. - Ecologia Balkanica, 2: 25-38. [Full text - PDF] . Chilingirova R.E., J.N. Staykova, I.G. Velcheva, V.M. Naydenova. 2011. Heavy metals content in soil near non-ferous metals production facility and domestic wastes landfill in the area of Kardzhali town. - Ecologia Balkanica, 3(1): 19-24 [Full text - PDF] . Georgieva E., I. Velcheva, A. Arnaudov. 2010. CLINICAL, HEMATOLOGICAL AND MORPHOLOGICAL STUDIES ON EX SITU INDUCED COPPER INTOXICATION IN CRUCIAN CARP (CARASSIUS GIBELIO). - Journal of Central European Agriculture, 11(2): 165-172 [Full text - PDF] . Velcheva I., S. Petrova, I. Mollov, G. Gecheva, D. Georgiev. 2012. Herbicides impact on the community structure of the soil mesofauna. - Bulgarian Journal of Agricultural Science, 18(5): 742-748. [Full text - PDF] . Petrova S., E. Mehmed, I. Mollov, D. Georgiev, I. Velcheva. 2012. Molluscs (Mollusca: Gastropoda, Bivalvia) from The Upper Eocene of Perunika Village (East Rhodopes, Bulgaria) – Preliminary Results. - Acta Zoologica Bulgarica, Suppl. 4: 233-236. [Full text - PDF] . Velcheva I., S. Petrova, V. Dabeva, D. Georgiev. 2012. Eco-physiological Study on the Influence of Contaminated Waters from the Topolnitza River Catchment Area on Some Crops. - Ecologia Balkanica, 4(2): 33-41 [Full text - PDF] . Petrova S., L. Yurukova, I. Velcheva. 2012. Horse chestnut (Aesculus hippocastanum L.) as a biomonitor of air pollution in the town of Plovdiv (Bulgaria). - J. BioSci. Biotech., 1(3): 241-247 [Full text - PDF] . 2. Kostadinova P., I. Velcheva, K. Kuzmova (2002): Fundamentals of Ecology, Agricultural University, Plovdiv, pp. 250. (In Bulgarian). 3. Velcheva I., A. Tsekov, A. Irikov, B. Temelkov, G. Gecheva, I. Mollov, D. Georgiev. (2008): Guidance for Laboratory and Field Exercises of Ecology. University of Plovdiv Publishing House, Plovdiv. 155 p. (In Bulgarian). 4. Georgiev D., I Velcheva, G. Gecheva, S. Petrova, I. Mollov. (2011): Contamination of waters and its impact on the ecosystems. University of Plovdiv Publishing House, Plovdiv. 155 p. (In Bulgarian). 5. Velcheva I., A. Tsekov, A. Irikov, G. Gecheva, D. Georgiev, I. Mollov, S. Petrova, B. Nikolov, B. Todorova, B. Temelkov. 2013. Field Exercises of General and Conservation Ecology. University of Plovdiv Publishing House, Plovdiv. 157 p. (In Bulgarian). 6. Velcheva I., A. Tsekov, A. Irikov, D. Georgiev, I. Mollov, S. Petrova. 2013. Laboratory Exercises of Ecology. University of Plovdiv Publishing House, Plovdiv. (In Bulgarian).